-As we reported a few days ago, Natalie is on the cover of Marie Claire Australia Magazine this month, and we have a short summary of the interview included in the edition here. -“This Changes Everything” documentary, a look into gender discrimination in the cinema industry , will be screened at the Bentonville Film Festival next May, Deadline reports. Los Angeles Times has a short but interesting interview with Natalie. In the article she talks about her involvement in Vox Lux, and what she is currently looking for in her film career. Today is the day. Vox Lux opens in USA in a limited released, and more interviews are emerging. Entertainment Weekly caught up with Natalie to discuss her 10-day excursion into mainstream music, singing Sia’s songs, roughing it with Beyoncé’s backup dancers, and transforming into a fervent pop star on the edge. Also “Wrapped Up”, one of the Sia´s Songs, has released Today. It´s available in Spotify, iTunes and Amazon. The full album will be released on December 14. USA Today has published an interview with Natalie on the occasion of the American premiere of Vox Lux. Here it is. 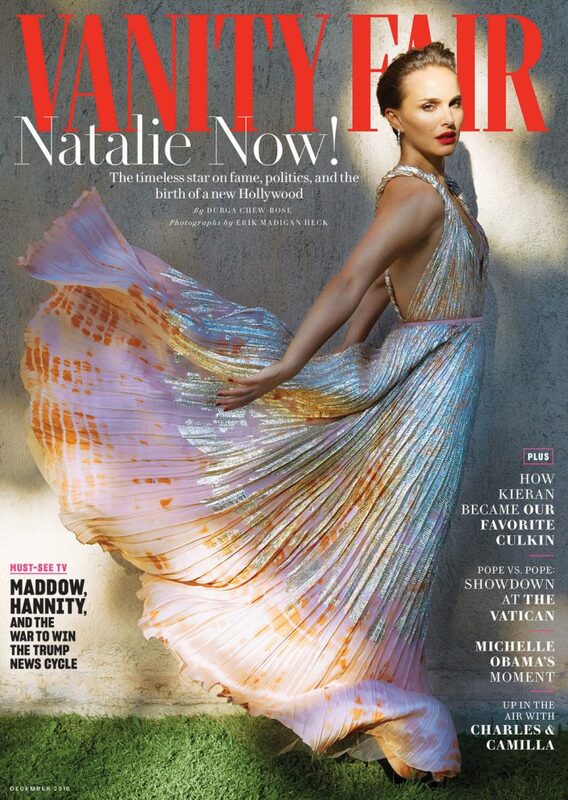 Natalie Portman graces the cover of the new Vanity Fair and on their site is a really nice long interview article with the actress, including photos from a new shoot. Here’s a quote from the article from Vox Lux director, Brady Corbet. Click the image to redirect to the full cover story. Natalie, Emma Gonzalez, Tiffany Haddish, Regina King and Lena Waithe will be honored at Variety’s Power of Women next Friday, October 12. Because of this, Today Variety has published an extensive interview with Natalie on pay disparity, sexual harassment and what’s next for Time’s Up. There have been some standout on-screen interviews with Natalie Portman in recent weeks, most of them very polished and professional. Today we have something a bit different – Aaron Fogelson managed to get Natalie to chat about a range of topics during her Boston Calling appearance. It’s quite endearing thanks to the low-fi quality of the surroundings and Aaron looking like he’s having the best day of his life. You signed the Roman Polanski petition after he was arrested in Switzerland in 2009. How do you feel about that now? NP: I very much regret it. I take responsibility for not thinking about it enough. Someone I respected gave it to me, and said, “I signed this. Will you too?” And I was like, sure. It was a mistake. The thing I feel like I gained from it is empathy towards people who have made mistakes. We lived in a different world, and that doesn’t excuse anything. But you can have your eyes opened and completely change the way you want to live. My eyes were not open. –Film Journal has also an interesting interview with Natalie and director Alex Garland about the film. -Finally, this tweet seems to indicate that Natalie has finally started to shoot Vox Lux.